Increasing probing depths with the increasing severity of the periodontal disease has been consistently associated with the infrabony defects. Clinical studies have proven that residual pockets often persist after nonsurgical periodontal therapy or the use of access flaps, and resective techniques are associated with substantial loss of attachment and increases in soft tissue recession. Along with this, such techniques are characterized by repair (i.e., formation of long junctional epithelium) rather than regeneration (i.e., formation of root cementum with functionally oriented inserting periodontal ligament fibers connected to a new alveolar bone). Several types of bone grafts have been studied over the years, and periodontists continue to search for ideal materials. The two most common types of graft material used in periodontics today are autogenous and allogenic. Autogenous grafts are considered the gold standard as they retain the viability of cells and do not evoke any immunological response in the patient. These grafts contain live osteoblasts and osteoprogenitor stem cells and heal by osteogenesis. They constitute all the three components for tissue engineering, namely, scaffold, cells, and signaling molecules as an additional benefit. In the presence of adequate vascularization, osteoprogenitor cells (or preosteoblasts) proliferate and bridge the gap between the graft and the recipient bone. The preosteoblasts also generally form the first deposits of new bone. Transplanted osteocytes usually die in response to anoxia and the surgical injury. Transplanted osteoclasts, however, can survive transplantation and these may initiate the resorption of the graft. Autogenous bone grafts have been used for a long time. Because of many limitations and crude methods of procurement of the graft, it was not one of the most preferred methods for regeneration of the periodontal osseous defects. It has gained popularity in recent times because of the development of better techniques and consequently lesser morbidity. This review includes the development of the graft and the search has included all the articles related with its use in the specialty of periodontics and oral implantology. These disadvantages, along with the fact that the alveolar defects do not demand large amounts of bone, led to the growing use of intraoral grafts. The intraoral donor sites also have the benefit of conventional surgical access, proximity of donor and recipient sites, which reduces operative time and anesthesia time, discomfort to patients, and less morbidity compared to extraoral location, making it ideal for outpatient periodontal surgery. Although a number of donor sites have been described, there is no clear preference indicated in the literature for any specific donor site. There are several types of autogenous bone grafts that have been or are being used clinically. They include bone chips, osseous coagulum, bone blend intraoral, and extraoral cancellous bone and marrow. For periodontal defects, Nabers and O' Leary (1965) have reported a coronal increase in bone height by using cortical bone chips, removed by hand chisels during osteoplasty and ostectomy. Cortical bone chips due to their relatively large particle size 1,559.6 × 183 um and potential for sequestration were replaced by autogenous osseous coagulum and bone blend. The literature indicated a broad range when considering the influence of particle size for autologous bone grafts. Values from 125 μm up to 2 mm were reported as preferable. A critical minimum value was reported stating that particles less than 75-125 μm are rapidly resorbed, and do not participate in effective osteogenesis. Cancellous bone graft is the most commonly used source of autogenous graft. It provides an osteoinductive, osteoconductive, and osteogenic substrate, and the porous trabeculae are lined with functional osteoblasts, resulting in a graft that is highly osteogenic. Corticocancellous bone grafts intuitively offer the advantages of both cortical bone and cancellous bone: An osteoconductive medium and immediate structural stability from cortical bone, and the osteoinductive and osteogenic capabilities of cancellous bone. Bone blocks have the inherent advantage of stability and resistance to deformation. They can be used for the horizontal augmentation of alveolar bone defects for periodontal regeneration as well as reconstruction of the alveolar bone for implants and as a preprosthetic surgery for jaw reconstruction. Alveolar ridge augmentation is a necessity in many cases, which present in clinical practice to facilitate adequate bone volume for implant placement. The stabilization and intimate contact of these block grafts to the recipient bed have been considered crucial to a successful outcome. This can be achieved with the use of bone fixation screws or the simultaneous placement of dental implant. Aggressive recipient bed preparation with decortication, intramarrow penetration, and inlay shaping also has been supported because of increases in the rate of revascularization, the availability of osteoprogenitor cells, and the increased rate of remodeling. The healing of autogenous block grafts has been described as "creeping substitution" where viable bone replaces the necrotic bone within the graft, and is highly dependent on graft angiogenesis and revascularization. Autogenous bone block can be harvested from the mandibular symphysis,  ramus, or external oblique ridge, and in areas beyond the root apices. It can be procured either by bone mill or by osteotomy procedures. However, cell viability seems to be significantly influenced by the harvesting technique. Conventional osteotomy or milling procedures have some limitations such as overheating of bone when contaminations of bone, which lead to possible structural bone changes and toxic effects on living cells. In order to overcome some of these problems, a newly developed piezoelectric device has been used for harvesting the autogenous bone block. Piezoelectric bone surgical technique has an advantage of low surgical trauma, exceptional control during surgery, and fast-healing response of tissues. A controversy remains as to whether cortical or spongy bone is the material of choice for autologous bone grafts (Girdler and Hosseini 1992; Schwipper et al. 1997). , Large defects undoubtedly require great amounts of bone that can only be harvested from extraoral donor sites such as the iliac crest (Jin et al. 2004; Kinsel and Turbow 2004; Turunen et al. 2004) ,, and tibia (Jakse et al. 2001; Mazock et al. 2004). , Smaller defects can be treated with limited bone volumes that can be harvested intraorally, also exploiting lower resorption (Smith and Abramson 1974; Zins and Whitaker 1983; Borstlap et al. 1990), ,, enhanced vascularization (Zins and Whitaker 1983),  and better incorporation (Borstlap et al. 1990  ) of bone grafts of membranous origin as compared with endochondral origin. Bone harvesting and treatment may suffer from microbial contamination (Young et al. 2001, 2002a). Once the bone graft has been procured, it should be transplanted rapidly into the patient. Salivary contamination should be avoided and the recipient site should be appropriately managed. The longer the bone remains exposed to air, the lower the number of viable osteogenic cells that will actually be transplanted with the graft. The success rate of implants placed in onlay graft regenerated ridges ranges 72,8-97% after follow-up periods ranging from 6 months to 10 years, with all the studies but two, reporting a success rate higher than 84% (range 84-97%). The lowest annual failure rate (0.1%) of rough surface implants was observed using autogenous particulated bone graft. Although a plethora of materials are available for the regeneration of bone, autogenous bone graft remains one of the most frequently used modalities for not only the regeneration of osseous defects but also foe ridge augmentation and sinus floor lift in the discipline of periodontics and implant dentistry. Various techniques and types of the graft can be used depending on the availability and indications. Randomized well-controlled studies should be conducted to determine the true potential of the graft and newer equipment can be developed for easier and better procurement of the material from the donor sites. Sculean A, Nikolidakis D, Nikou G, Ivanovic A, Chapple IL, Stavropoulos A. Biomaterials for promoting periodontal regeneration in human intrabony defects: A systematic review. Periodontol 2000 2015;68:182-216. Rosenberg E, Rose LF. Biologic and clinical considerations for autografts and allografts in periodontal regeneration therapy. Dent Clin North Am 1998;42:467-90. Hegedus Z. The rebuilding of the alveolar process by bone transplantation. Dent Cosmos 1923;65:736-42. Nabers CL, O′Leary TJ. Autogenous Bone Transplants in the treatment of osseous defects. J Periodontol 1965;36:5-14. Linghorne WJ, O′Connell DC. Studies in the regeneration and reattachment of supporting structures of the teeth. II. Regeneration of alveolar process. J Dent Res 1951;30:604-14. Burwell RG. Studies in transplantation of bone. J Bone Jt Surg 1964;48-B:532. Rivault AF, Toto PD, Levy S, Gargiulo AW. Autogenous bone grafts: Osseous coagulum and osseous retrograd procedures in primates. J Periodontol 1971;42:787-96. Steringa B. Studies of the vascularization of bone grafts. J Bone Joint Surg 1957;46B:395. Schallhorn RG. The use of autogenous hip marrow biopsy implants for bony crater defects. J Periodontol 1968;39:145-7. Sullivan H, Vito A, Melcher A. A histological evaluation of the use of hemopoietic marrow in intrabony, periodontal defects. Int Assoc Dent Res (Abstracts) 1971, p. 171. Dragoo MR, Sullivan HC. A clinical and histologic evaluation of autogenous iliac bone grafts in humans. II. External root resorption. J Periodontol 1973;44:614-25. Schallhorn RG, Hiatt WH, Boyce W. Iliac transplants in periodontal therapy. J Periodontol 1970;41:566-80. Hiatt WH, Schallhorn RG. Intraoral transplants of cancellous bone and marrow in periodontal lesions. J Periodontol 1973;44:194-208. Froum SJ, Thaler R, Scopp IW, Stahl SS. Osseous Autografts. I. 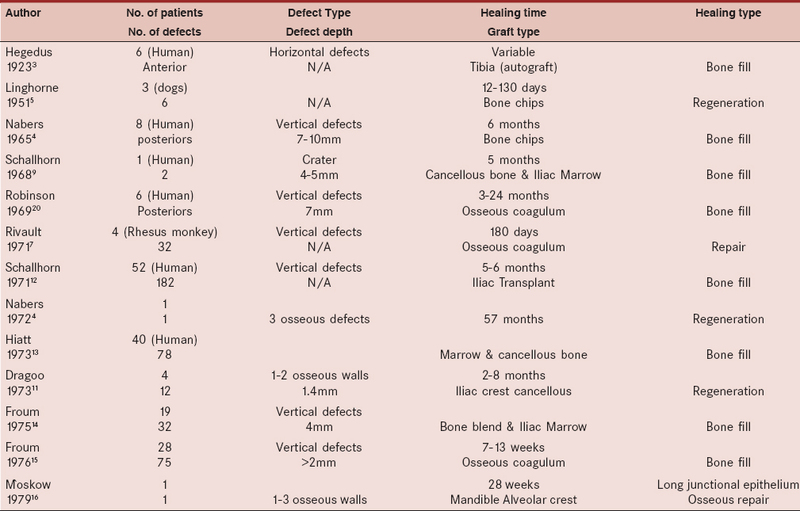 Clinical responses to bone blend or hip marrow grafts. J Periodontol 1975;46:515-21. Froum SJ, Ortiz M, Witkin RT, Thaler R, Scopp IW, Stahl SS. Osseous Autografts. III. Comparison of osseous coagulum-bone blend implants with open curettage. J Periodontol 1976;47:287-94. Moskow BS, Karsh F, Stein SD. Histological assessment of autogenous bone graft: A case report and critical evaluation. J Periodontol 1979;50:291-300. Myeroff C, Archdeacon M. Autogenous bone graft: Donor sites and techniques. J Bone Joint Surg Am 20117;93:2227-36. Mellonig JT. Autogenous and allogeneic bone grafts in periodontal therapy. Crit Rev Oral Biol Med 1992;3:333-52. Brunsvold MA, Mellonig JT. Bone grafts and periodontal regeneration. Periodontol 1993;1:80. Robinson RE. Osseous coagulum for bone induction. J Periodontol 1969;40:503-10. Rosenberg MM. Free osseous tissue autografts as a predictable procedure. J Periodontol 1971;42:195-209. Zayner DJ, Yukna RA. Particle size of periodontal bone grafting materials. J Periodontol 1984;55:406-9. Pandit N, Pandit IK, Malik R, Bali D, Jindal S. Autogenous bone block in the treatment of teeth with hopeless prognosis. Contemp Clin Dent 2012;3:437-42. McAllister BS, Haghighat K. Bone augmentation techniques. J Periodontol 2007;78:377-96. Zaffe D, D′Avenia F. A novel bone scraper for intraoral harvesting: A device for filling small bone defects. Clin Oral Implants Res 2007;18:525-33. Zerbo IR, de Lange GL, Joldersma M, Bronckers AL, Burger EH. Fate of monocortical bone blocks grafted in the human maxilla: A histological and histomorphometric study. Clin Oral Implants Res 2003;14:759-66. Springer IN, Terheyden H, Geiss S, Härle F, Hedderich J, Açil Y. Particulated bone grafts - Effectiveness of bone cell supply. Clin Oral Implants Res 2004;15:205-12. Klein-Nulend J, van der Plas A, Semeins CM, Ajubi NE, Frangos JA, Nijweide PJ, et al. Sensitivity of osteocytes to biomechanical stress in vitro. FASEB J 1995;9:441-5. Weinbaum S, Cowin SC, Zeng Y. A model for the excitation of osteocytes by mechanical loading-induced bone fluid shear stresses. J Biomech 1994;27:339-60. Guillaume B, Gaudin C, Georgeault S, Mallet R, Baslé MF, Chappard D. Viability of osteocytes in bone autografts harvested for dental implantology. Biomed Mater 2009;4:015012. Lee CY. Procurement of autogenous bone from the mandibular ramus with simultaneous third-molar removal for bone grafting using the Er, Cr: YSGG Laser: A preliminary report. J Oral Implantol 2005;31:32-8. Girdler NM, Hosseini M. Orbital ﬂoor reconstruction with autogenous bone harvested from the mandibular lingual cortex. Br J Oral Maxillofac Surg 1992;30:36-8. Schwipper V, von Wild K, Tilkorn H. Reconstruction of frontal bone, periorbital and calvarial defects with autogenic bone. Mund Kiefer Gesichtschir 1997;(Suppl 1):S71-4. Jin D, Qu D, Chen J, Zhang H. One-stage anterior interbody autografting and instrumentation in primary surgical management of thoracolumbar spinal tuberculosis. Eur Spine J 2004;13:114-21. Kinsel RP, Turbow MM. The use of a trephine biopsy needle to obtain autogenous corticocancellous bone from the iliac crest: Technical note. Int J Oral Maxillofac Implants 2004;19:438-42. Turunen T, Peltola J, Yli-Urpo A, Happonen RP. Bioactive glass granules as a bone adjunctive material in maxillary sinus ﬂoor augmentation. Clin Oral Implants Res 2004;15:135-41. Jakse N, Seibert FJ, Lorenzoni M, Eskici A, Pertl C. A modiﬁed technique of harvesting tibial cancellous bone and its use for sinus grafting. Clin Oral Implants Res 2001;12:488-94. Mazock JB, Schow SR, Triplett RG. Proximal tibia bone harvest: Review of technique, complications, and use in maxillofacial surgery. Int J Oral Maxillofac Implants 2004;19:586-93. Smith JD, Abramson M. Membranous vs. Endochondral bone autografts. Arch Otolaryngol 1974;99:203-5. Zins JE, Whitaker LA. Membranous versus endochondral bone: Implications for craniofacial reconstruction. Plast Reconstr Surg 1983;72:778-84. Borstlap WA, Heidbuchel KL, Freihofer HP, Kuijpers-Jagtman AM. Early secondary bone grafting of alveolar cleft defects. A comparison between chin and rib grafts. J Craniomaxillofac Surg 1990;18:201-5. Young MP, Worthington HV, Lloyd RE, Drucker DB, Sloan P, Carter DH. Bone collected during dental implant surgery: A clinical and histological study. Clin Oral Implants Res 2002;13: 298-303. Pappalardo S, Puzzo S, Carlino V, Cappello V. Bone substitutes in oral surgery. Minerva Stomatol 2007;56:541-57. Pjetursson BE, Tan WC, Zwahlen M, Lang NP. A systematic review of the success of sinus ﬂoor elevation and survival of implants inserted in combination with sinus ﬂoor elevation. J Clin Periodontol 2008;35(Suppl):216-40. Clementini M, Morlupi A, Agrestini S, Ottria L. Success rate of dental implants inserted in autologous bone graft regenerated area: A systemic review. Oral Implantol (Rome) 2012;4:3-10. Fontana F, Santoro F, Maiorana C, Iezzi G, Piattelli A, Simion M. Clinical and histologic evaluation of allogeneic bone matrix versus autogenous bone chips associated with titanium reinforced e-PTFE membrane for vertical ridge augmentation: A prospective pilot study. Int J Oral Maxillofac Implants 2008; 23:1003-12. Chanavaz M. Maxillary sinus: Anatomy, physiology, surgery, and bone grafting related to implantology: Eleven years of surgical experience (1979-1990). J Oral Implantol 1990;16:199-209. Haas R, Watzak G, Baron M, Tepper G, Mailath G, Watzek G. A preliminary study of monocortical bone grafts for oroantral fistula closure. Oral Surg Oral Med Oral Pathol Oral Radiol Endod 2003;96:263-6. Rickert D, Slater JJ, Meijer HJ, Vissink A, Raghoebar GM. Maxillary sinus lift with solely autogenous bone compared to a combination of autogenous bone and growth factors or (solely) bone substitutes. A systematic review. Int J Oral Maxillofac Surg 2012;41:160-7. Esposito M, Grusovin MG, Rees J, Karasoulos D, Felice P, Alissa R, et al. Effectiveness of sinus lift procedures for dental implant rehabilitation: A Cochrane systematic review. Eur J Oral Implantol 2010;3:7-26. Dr. Nymphea Pandit, a 1993 graduate from S.C.B Medical College Cuttack completed her M.D.S. in Periodontics (1998) from Government Dental College Ahmedabad. She has received the Best Graduate Award for Excellent Performance in the Four years of Graduate Programme by ICDRO in the year1993. She is also the recipient of Colgate Palmolive Award for highest marks in the subject of periodontology and ISPPD award for highest marks in the subject of Pedodontics and Preventive Dentistry. She is presently working as the Professor & Head, Department of Periodontology, D.A.V Dental College and Hospital Yamunanagar. She has 10 international and 20 national publications and has been a keynote speaker at more than 30 foras at national and State levels. She has authored a book titled " Concise Periodontics" . She is an EC Member of Indian Society of Periodontology and in the Editorial Board of the Journal of Indian Society of Periodontology and many other National Journals. She has been at different posts in the IDA yamunanagar Branch including President in the year 2012. She has been cited in the Marquis Who's Who in the World (2011).